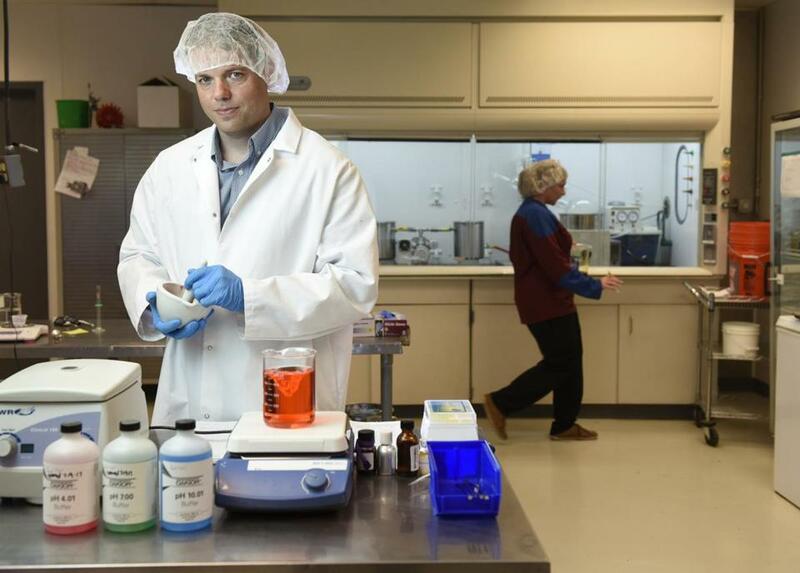 Jay Denniston, director of science for Dixie Elixirs, a cannabis company in Denver, standing in the company laboratory. DENVER — Many college students will tell you that making pot brownies is easy — just sprinkle a little marijuana into a pan of melting butter, then follow the instructions on the back of the Duncan Hines box. But marijuana entrepreneurs in this center of cannabis innovation face a much higher bar. They have no trouble dreaming up creative treats and concoctions infused with psychoactive THC, but meeting hundreds of pages of health and safety regulations means their imagination is handcuffed. And for good reason: The rules demand precise dosing, uniform potency, and warning symbols imprinted on the food itself. Pot-dusted almonds, Tootsie Roll-like bites, Rice Krispies Treat equivalents? All tough to produce as a result. Every industry has its particular challenges. Marijuana-infused product manufacturers, which make a highly regulated, often psychoactive product that’s still illegal under federal law, face more than most — a reality coming soon to Massachusetts. “You wouldn’t think making gummies is so hard, but it actually is,” said Nancy Whiteman, cofounder and co-owner of Wana Brands, Colorado’s number one edibles company in sales and units sold. The struggles and triumphs of such businesses in Colorado, where stores have been selling retail marijuana for three years and seven months, offer a preview of Massachusetts’ future. Over the next year, a soon-to-be appointed commission will make regulations that will determine what form pot-infused products will take in the state’s retail marijuana market. And the commission will be taking cues from Colorado. Denver-based Dixie Elixirs, one of the country’s biggest producers of pot products, makes root beer and lemonade, mints and tarts, chocolates and drops, cinnamon and citrus gummies, bath soak and muscle balm — all infused with compounds derived from marijuana. 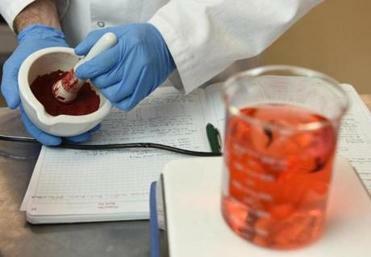 Jay Denniston grinds a natural red food coloring made from beets. Each serving has to be marked with an exclamation point and the letters THC, for tetrahydrocannabinol, marijuana’s primary psychoactive compound. That helps differentiate a pot candy from a regular one. At Dixie headquarters, a building in an industrial part of town where the air carries a whiff off weed, Hodas ticked off several examples of regulation driving the business’s new products. But instead of expanding into a sour Twizzler-like concoction or jelly beans, Dixie made Tarts — half-inch-or-so circles that look sort of like SweeTarts. Dixie uses the same pill press that it uses to make its mints, which eased the process of imprinting the warning symbol and evenly distributing the THC dosage. Another example: Dixie Rolls, a pot-infused Tootsie Roll equivalent, were popular. But the company had to pull the product in Colorado. It was made with an extruder, and stamping the warning label on the rolls proved extremely difficult. Edible-ink technology, Hodas said, was lacking. But around the same time, Dixie expanded its chocolate bar line to include white chocolate with rainbow sprinkles (“Birthday Cake”). Chocolate bars happen to be one of the easiest confections to make in compliance with all the regulations. Marijuana distillate can be evenly distributed into a chocolate emulsion for homogeneous dosing. It can be molded into break-off-able squares, making it easy for people to recognize the size of a serving. And the molds can be crafted to imprint a warning symbol. And, she said, the next question is: Can it be easily divided and made so that the THC level is the same in each serving? Wana has taken products off the market in Colorado when it couldn’t figure out how to meet new guidelines. Almonds glazed with a sugar and THC mix were delicious, according to Whiteman. But “it was very, very hard to make that homogeneous and impossible to figure out how to mark it” with the symbol, she said. In Massachusetts, a yet-to-be-appointed five-person board will craft the regulations for infused-product manufacturers, along with pot shops, farms, and testing facilities. 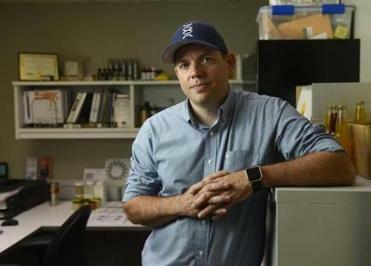 Adam Fine, a Boston-based lawyer with the national marijuana-focused law firm Vicente Sederberg LLC, said what the Cannabis Control Commission decides will, in large part, determine how successful businesses that make edibles will be. He expressed hope regulators will take into account the practicalities of running a business, along with public health. Politicians, including Governor Charlie Baker, and public health officials have voiced sharp concerns about weed-infused edibles. They worry about their appeal to children and the perils of overconsumption. But industry executives say properly-regulated edibles — all come in child-resistant packaging — are safe. And they are easier to take in small doses than smoking, so adults can get a buzz like wine’s. Jay Denniston, director of science, for Dixie Elixirs. In Denver, Jay Denniston, Dixie’s director of science, emphasized chemistry is an important determinant of which products can clear regulatory hurdles, fulfill consumer desires, and be crafted cost-effectively. And it’s finding the, well, sweet spot between those three competing pressures that makes for a successful business. Some questions he asks colleagues: In each edible products, do you deliver a pot taste or not? If you do want to deliver that cannabis-y taste, with what flavor do you pair it? If not, how do you mask it? Dixie Elixirs, founded in 2010 by entrepreneurs Chuck Smith and Tripp Keber, has about 100 employees working for or with the brand in three states where recreational use is legal, Colorado, California, and Nevada, and one medical-only state, Arizona. But the products are uniform around the country, and ideas for new ones go through Denniston’s office. A certain cacao-based product on the other hand . . .